We met with Paul Bax on the day of the CPA Group AGM at which Paul was recognised for his 10 years of service with CPA Group by Chairman Harley Sparke. Harley spoke very positively about Paul’s service, his loyalty and quality of contribution. Harley noted that in modern times, staying in one company for such an extended period is increasingly rare and worthy of recognition. I was 15 years with the Defence Force, working in Darwin, Sydney, Brisbane and Townsville. After that I worked at QLD Corrections for a short time (12 months), then 8 months in Nauru. I am working as a team Leader at Norwich Park in Dysart. It is a BMA open cut coal mine currently in care and maintenance. It is a 24/7 service managing site access, working as part of an excellent CPA Group asset protection team. I work a combination of days and nights, week on week off on a drive in drive out basis. What other CPA Group sites have you worked? Prior to Norwich Park I worked as a SAPO in Head Office. I also worked at the AngloAmerican Grosvenor mine construction site and before that at Dyno Nobel Project Aurora construction. We provide site access management, asset protection, D&A testing. The team consists of 6 people in total, 3 at any one time. The staff are all permanent, they are a really strong team. What do you find most challenging or fulfilling in your role? I get a lot of job satisfaction from being part of a great team. We get a lot of support from the site workers. I am accustomed to working remotely but it is a very long drive in and back – the fuel prices have been a challenge of late, as they have been for everyone. I enjoy a cold beer!! And a game of pool. We normally ask “what do you think your manager would say about you” but couldn’t get much from Paul who did not want to “blow his own trumpet”. In any event, we had heard glowing praise from Harley so I think we get the drift! I have had the pleasure of working with Paul for three years and during that time I have always found Paul to be a hardworking, passionate, loyal team member with a strong work ethic. 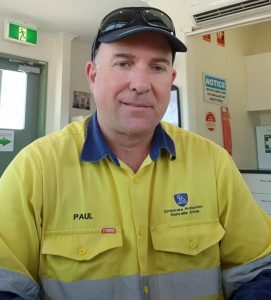 During the time I have known Paul he has performed a number of roles from Senior Asset Protection Officer responsible for the Brisbane Metro area to Supervisor for Norwich Park Mine and at all times holds himself and his team to the highest standard which is to be expected from a consummate professional. I look forward to working with Paul for another 10 years.